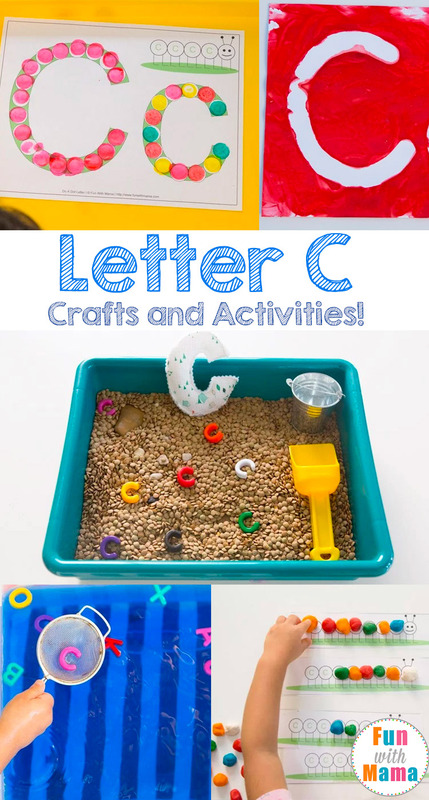 These printable letter c crafts and activities are perfect for your toddler or preschooler’s letter of the week homeschool curriculum. 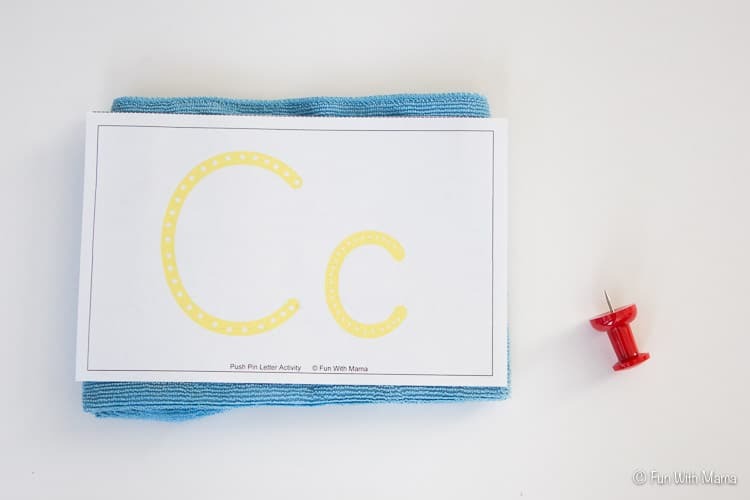 We love that printable letter crafts work on your child’s visual perception, fine motor skills and are a great way to teach letters or in this case, the letter C. These activities work perfectly for Tot School too! 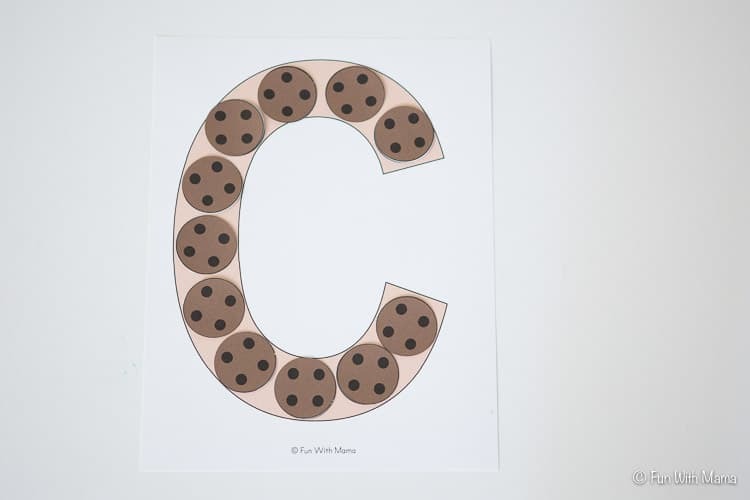 The letter C is for cat and the letter c is for caterpillar is the perfect addition to round off this kids printable activity pack. We have been working our way through our ABC’s and loving every minute of it. Letter A Crafts and activities were so much fun. 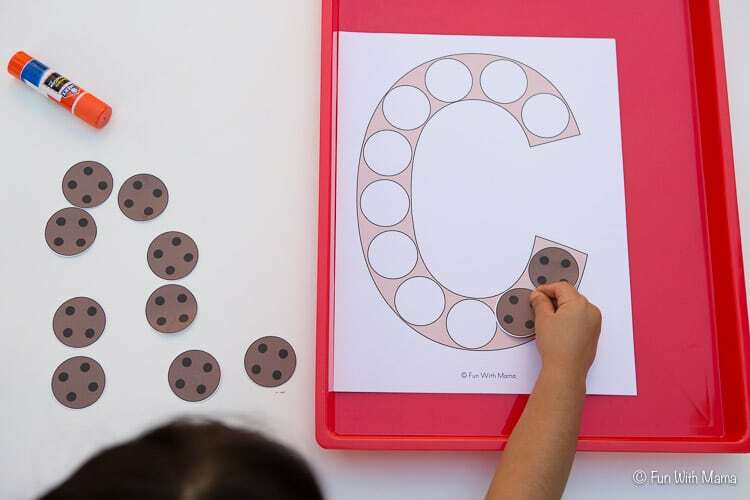 We couldn’t wait to get started on Letter C! My toddler (is a 3 year old still a toddler?) is having a blast with our letter of the week activities. 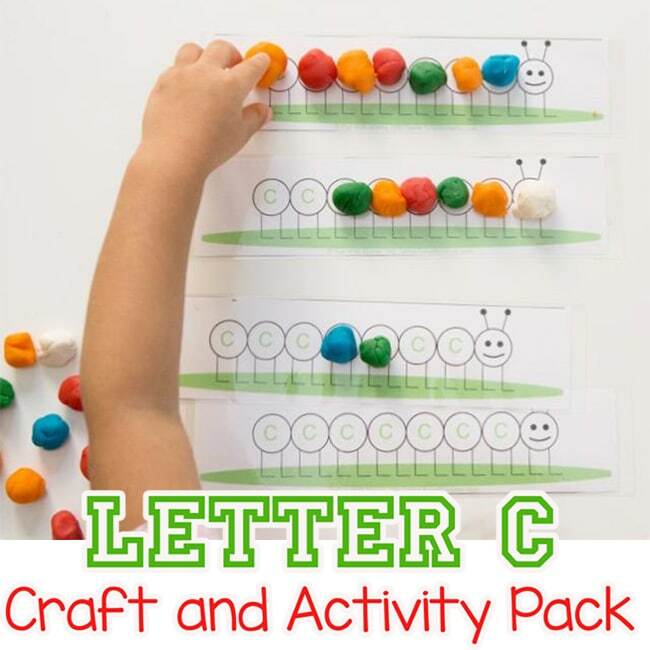 Many of these letter c activities feature around caterpillars. I suggest you go through the Caterpillar Life Cycle activity around the same time for more added fun! 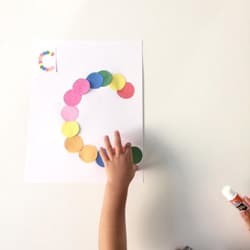 We do a lot of hands on alphabet activities for kids and I try my best to teach in a way that stimulates as many of my child’s five senses as I can. 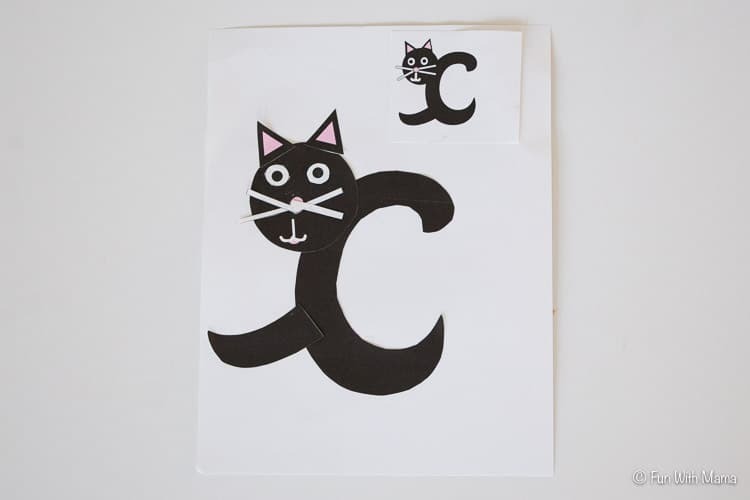 Please note that this post is very picture heavy because I give you a very thorough list of all the letter C crafts and activities we have been doing. I recommend products that we use and love in this post. Affiliate links are used. Because in our house we look for any reason to fingerpaint. 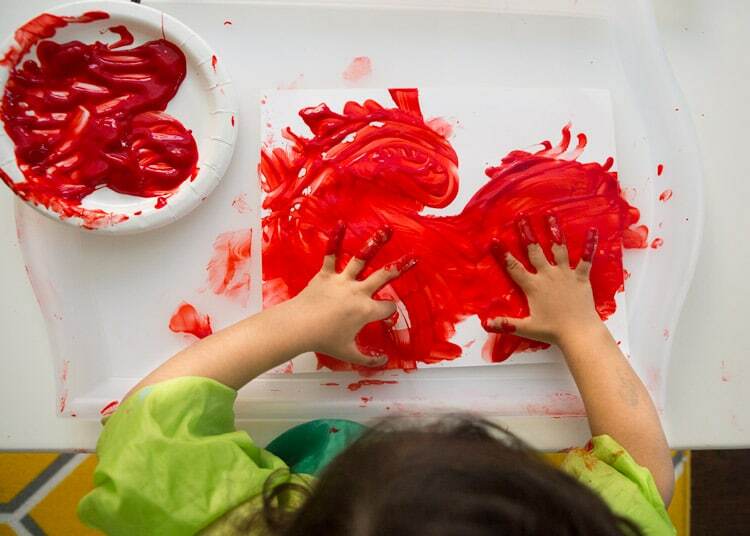 Read about the Benefits of finger painting to see why you too should encourage finger painting at any opportunity. 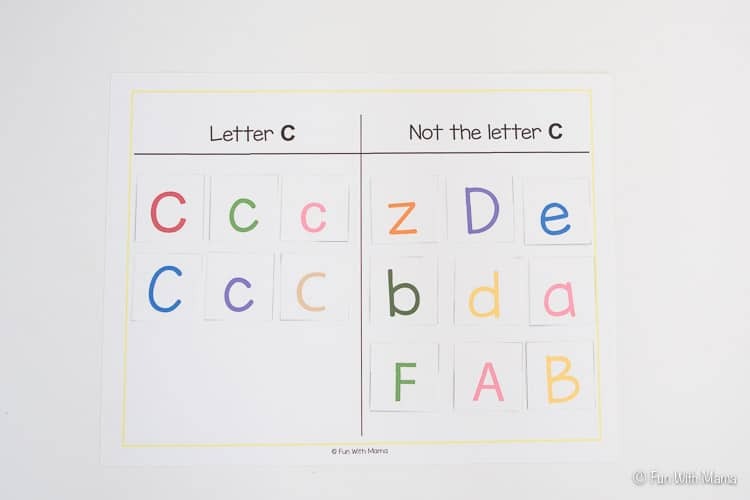 We played on ABC Mouse and did letter c activities. She could recognize the letter c and its sound through the app. 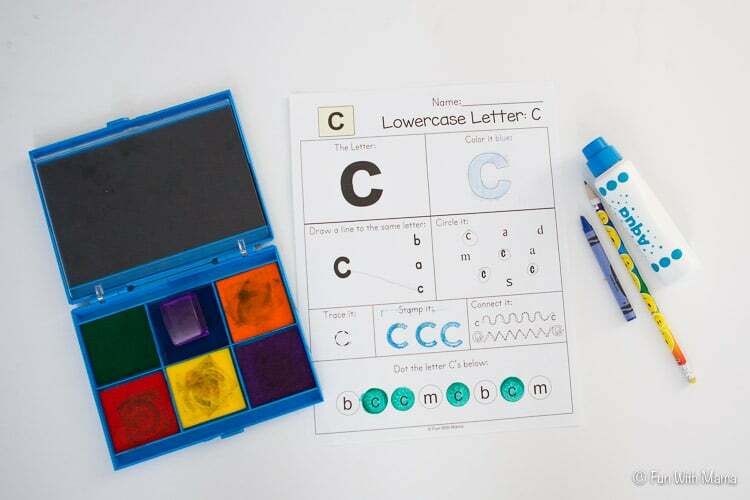 ABC Mouse– Download a free 30 day trial at ABC Mouse – This program is perfect for learning letters and so much more! 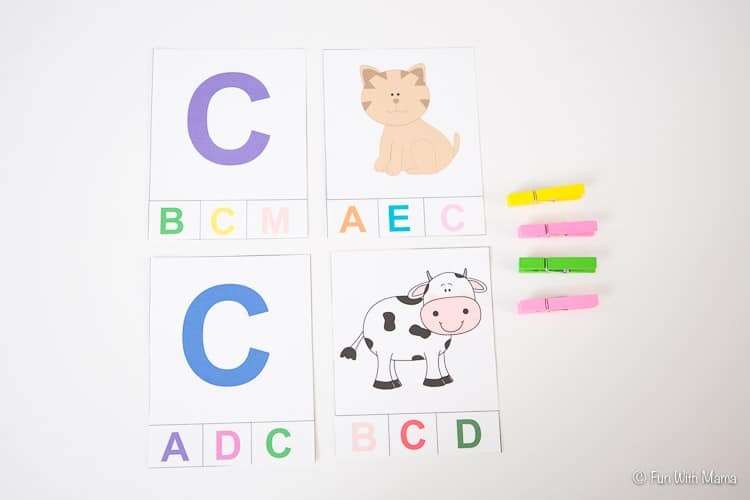 My daughter learned letter recognition and letter sounds for two alphabet letters the first night we did it. 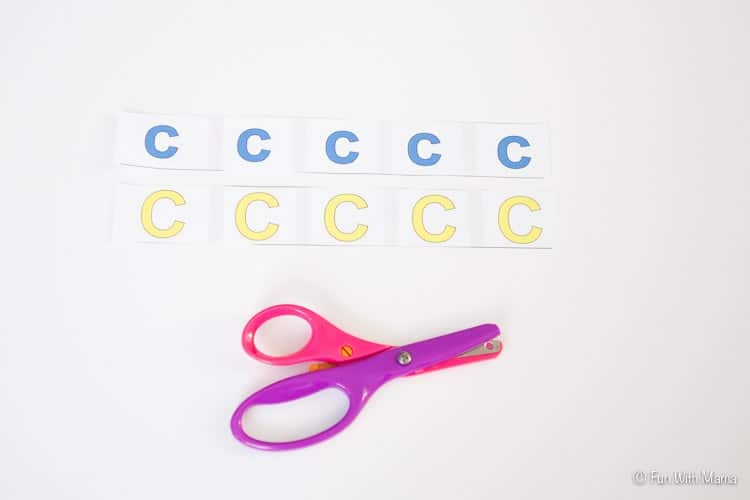 I added these letter c lacing alphabet letters to one of our current sensory bins and had her do a letter c hunt. 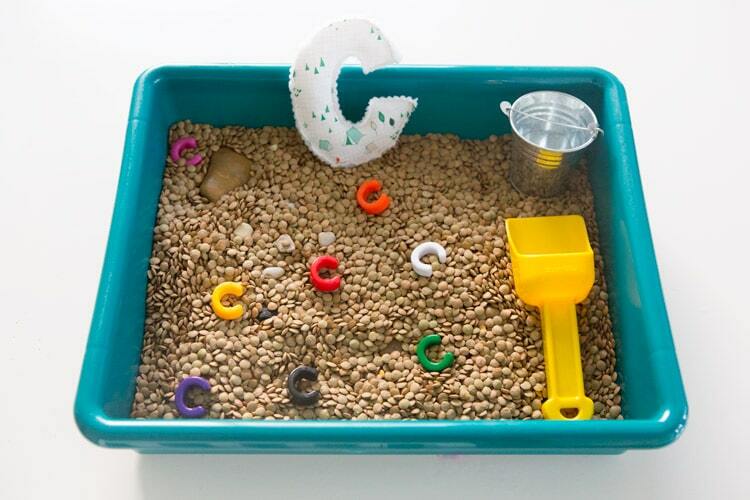 Preschool sensory bins invite a child to explore different tactile materials! 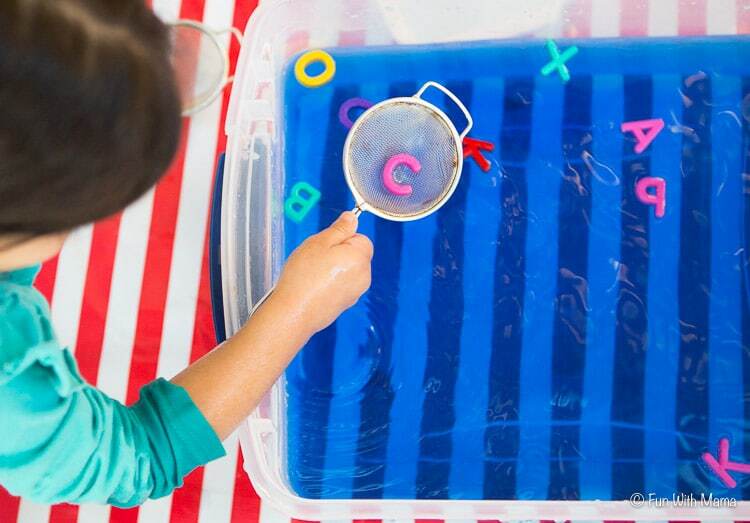 I placed a few alphabet letters in a tub of water and had her fish out all the letter C’s. 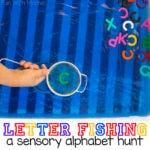 You can learn more about how to do this at this alphabet letter fishing blog post. 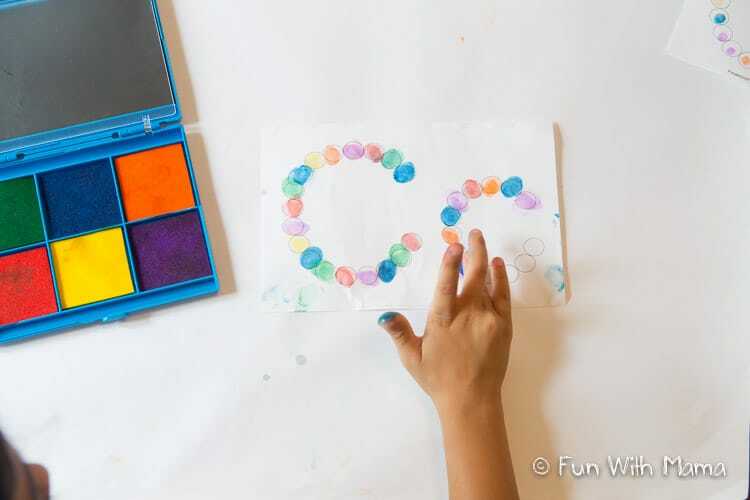 This activity was great to work on fine motor skills. Did you know that playdough balls strengthens a child’s fingers which is aa precursor to writing skills later on. 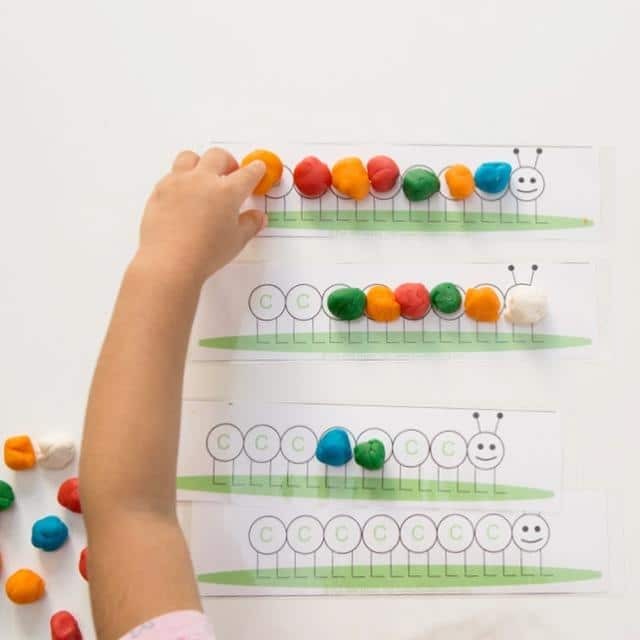 This printable Caterpillar Playdough Mats can be found as a homeschool freebie at the bottom of this post. 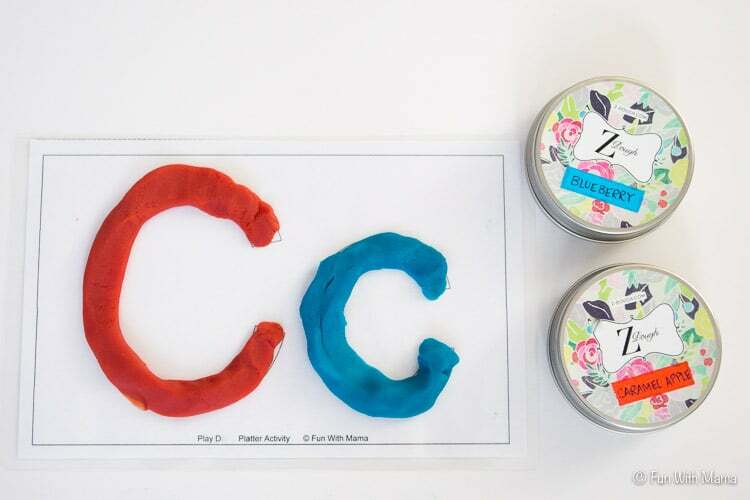 We used our Z Dough and paper template to create the letter c. We love how the z dough feels and smells but you could also try making homemade playdough with your kids. My daughter loves using the new kitchen that we bought and so C is for cooking was great for imaginary play. 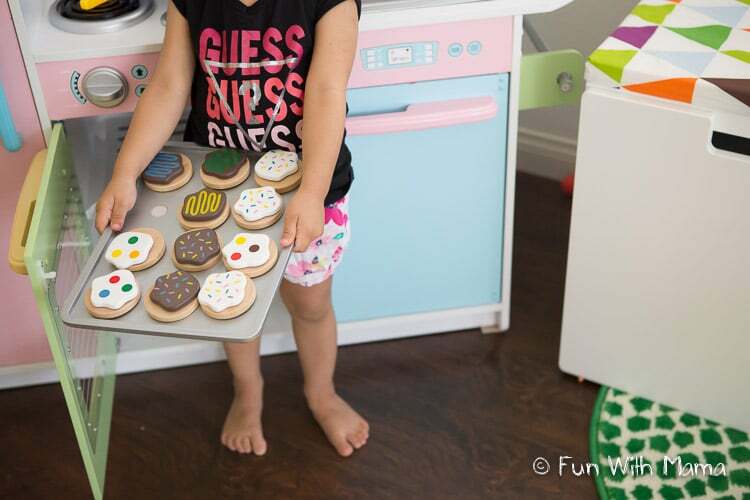 Besides being great for imaginary play these cookies are wonderful fun for counting too! I used these circle punches (a staple in my craft kit) to easily cut out the cookies. I design my printable activities according to the tools that I have so that I do not have to spend all day cutting things out. My 3 year old is currently obsessed with using clothespins. She has so much of fun with it so I try my best to design activities that will allow her to use clothespins in an educational way. Win Win! 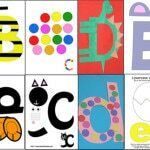 This is fun and an important activity because it really makes your child look at the letter c. It is a visual reminder in the differences of each letter and is the right amount of challenge. 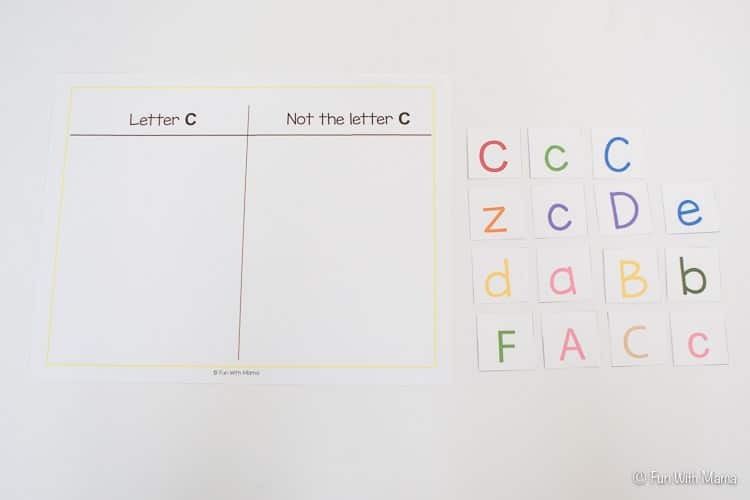 This activity is definitely more challenging because it is a letter c sound activity. Scissor skill activities are wonderful for this age because at 3 years old my daughter LOVES using scissors. I made the cutting lines a little thick so that she didn’t need to be so precise. I was very impressed with her skills here. We have these scissors and they are perfect for my 3 year old. First you can begin with the question, “Which one is the biggest?” Then place it to the one side. Then ask, “Which one is the smallest?” Place it on the other side. Then explain and work with your child about going from biggest to smallest or smallest to biggest. 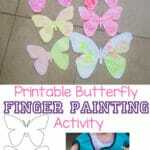 This activity was a major hit with 2 of my kids! Age didn’t matter when it came to doing fingerprints. 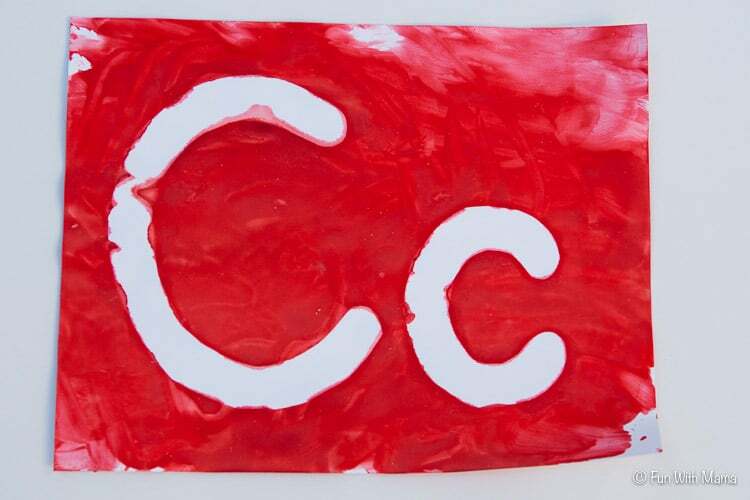 We did this 3 times during our Letter C Week. 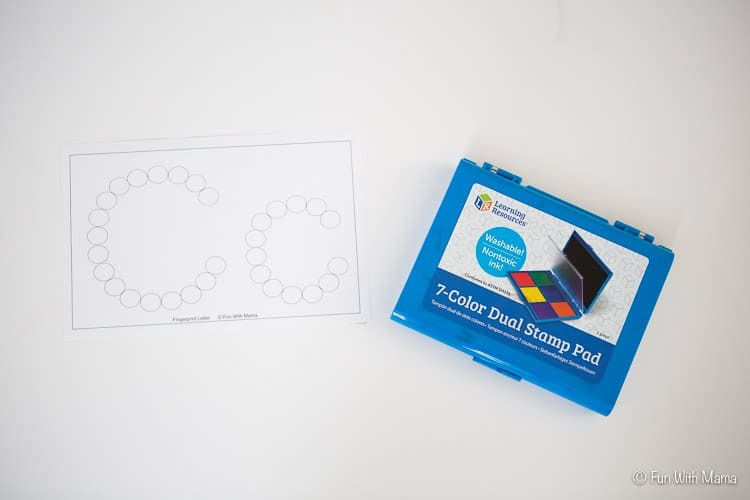 We have this stamp pad and love it! 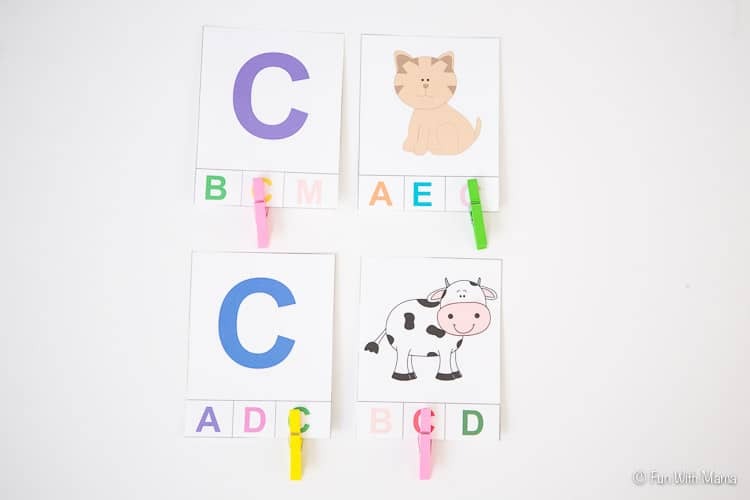 We have these jumbo push pins which are perfect for little hands. I placed a microfiber cloth underneath the paper and my daughter was good to go! 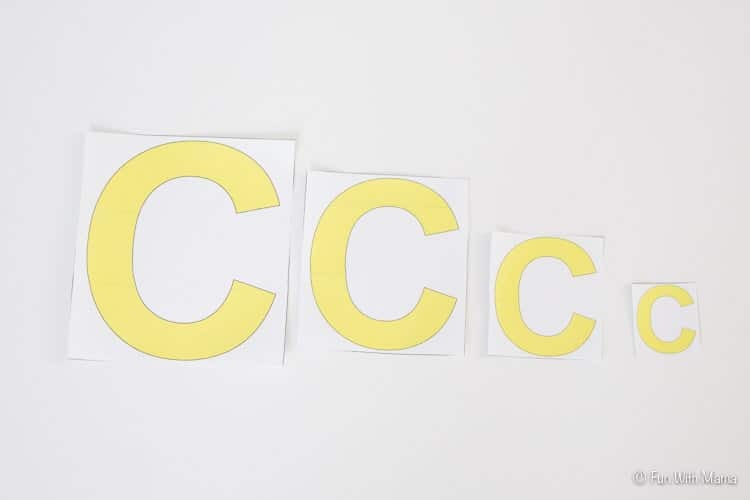 These Letter C Worksheets depend on the age of your child and whether your child enjoys worksheets. My 3 year old hasn’t done a worksheet before so I sat down with her and explained what needed to be done. We got to use our jumbo lowercase and uppercase stamps. 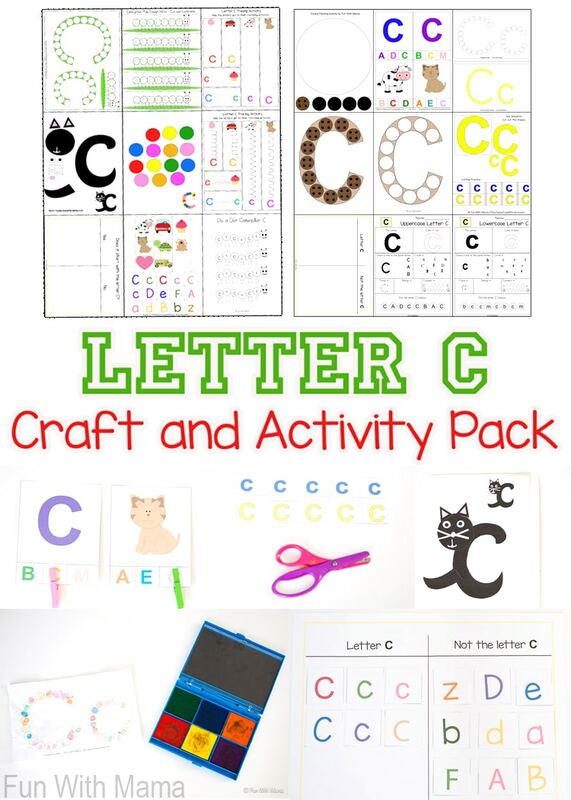 You can purchase the Letter C Craft and Activity Pack at my TPT Store. 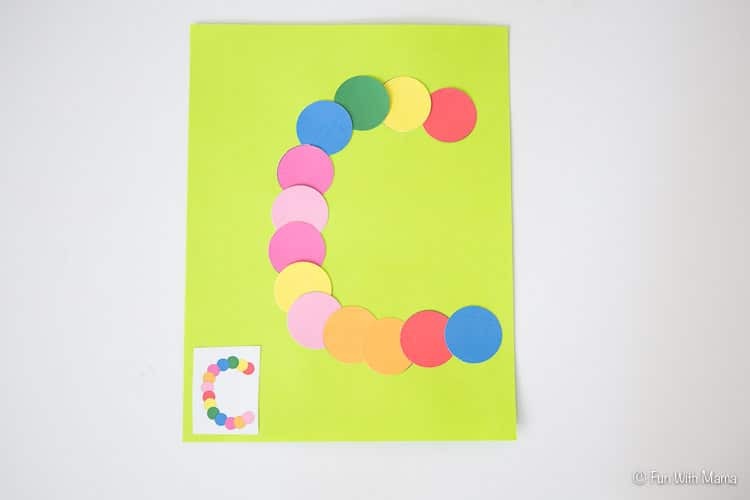 There are over 18 printable activities to allow your child to learn the letter c through hands on learning. This Craft Pack will be on sale for a short time so make sure to catch it now! 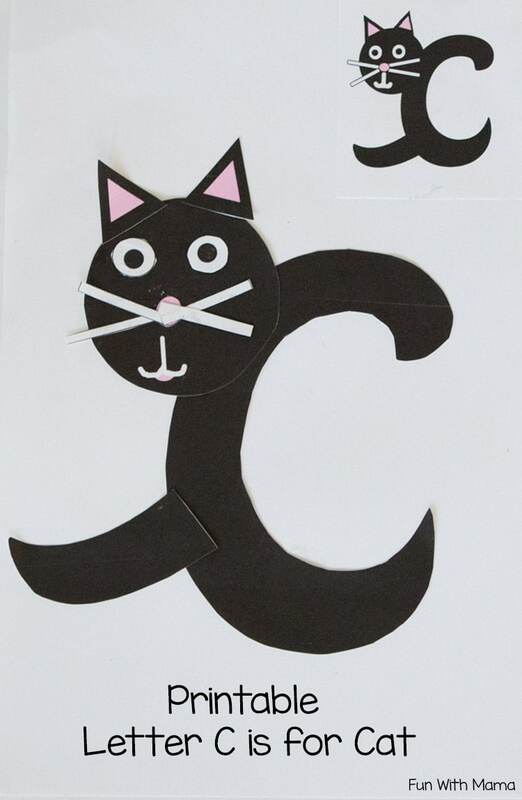 I hope you found many wonderful ideas here to add to your letter of the week curriculum and specially to your letter c week. I have 3 of the above activities free for my wonderful blog readers. 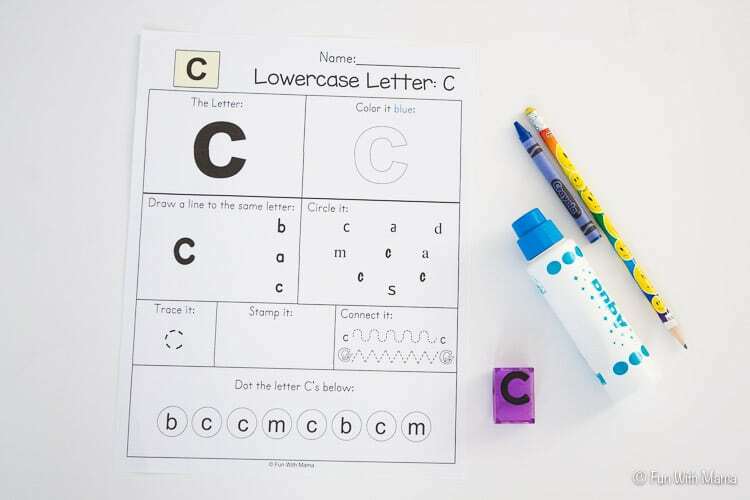 Download the Letter C Homeschool Freebies right here. 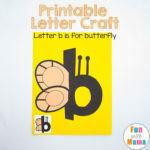 Don’t forget to grab all the Free Alphabet ABC Printable Packs! 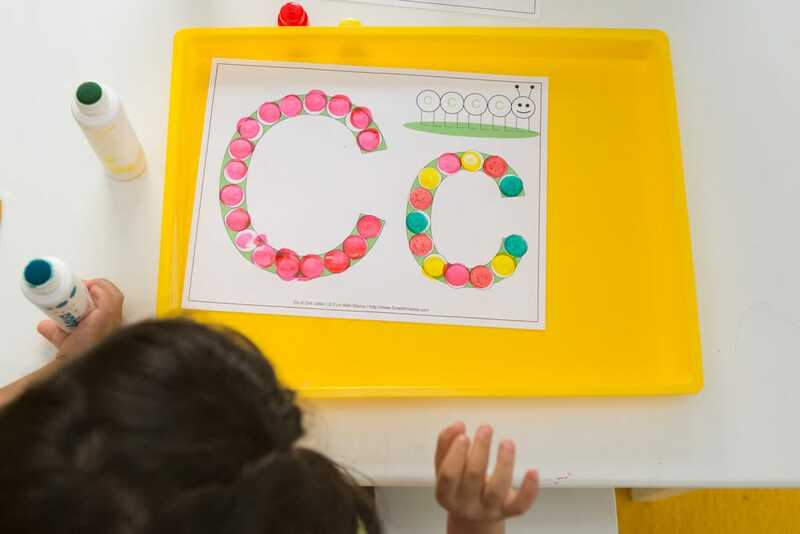 Have a look at what others did in Tot School this week.